Something about listening to White Rabbits’ ‘Kid On My Shoulders’ that just makes you want to let loose and punch someone. ‘Kid On My Shoulders’ overflows with intense rhythms and tremendous energy: multi-layered vocals on top of cascading piano stumbles, reminiscent of 50s styling while emanating a sense of danger and menace. The pulsating music, punctuated with aggressive tones creates a sense of the song charging directly at you. It’s immense fun to listen to; you’ll either feel like you want to move to the music, or like I said, punch someone. 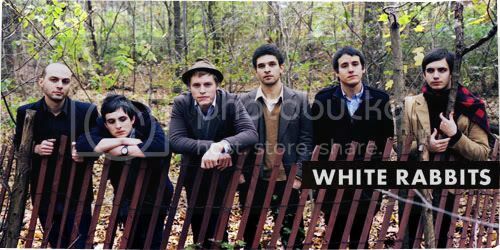 New York’s White Rabbits’ debut, Fort Nightly, was released to quite a number of favorable reviews. The album is an eclectic and vivid mix of tunes, distinctive from the rock expanses of music by most typical New York bands.